Safety touches every part of our business—every member of our employee and contractor workforce, every facility and workstation, and every vehicle we operate. Our aim is to create a climate where safety is at the forefront of every task performed. We continue to invest in technical training for our employees in the field, leadership training for managers and supervisors who oversee this work and steps to strengthen our operational procedures and policies to keep all of our workers safe. Our overarching goal is to have every one of our workers—employees and contractors—return home safely at the end of every day. We have expanded training for employees at all levels, including holding Safety Leadership Workshops to align leaders around PG&E’s safety strategy and to equip them with the tools they need to support their teams in building a safety-first culture. Establishing aggressive targets for safety and health to track and evaluate our performance and help create a stronger safety culture. We have also begun tracking metrics that serve as leading indicators of performance, such as calls to our around-the-clock nurse report line for early incident or injury reporting, and reported near-hits—incidents that were avoided. Conducting rigorous causal evaluations, which promote understanding the causes of specific incidents, putting corrective actions into place and tracking and monitoring these corrective actions to prevent recurrence of incidents. Performing risk assessments in the field to identify and mitigate potential work-related hazards and exposures. Enhancing our Motor Vehicle Safety Program to focus on serious preventable incidents and effective prevention strategies. We are also implementing vehicle technology that will provide feedback to the driver, aiding safe behavior. Our focus on workplace safety, and the impact that it is having, can be seen in a number of areas. Strengthened field safety specialist program. We standardized the roles and responsibilities of our safety specialists, who provide support to our business operations, and strengthened their skills and knowledge through training and professional development. Continued a PG&E-wide near-hit reporting program. This program, a safety best practice, encourages employees to share near hits and safety incidents and to promote a learning- and trust-based safety climate without the fear of reprisal. Completed Safety Leadership Workshops. The last of more than 5,000 participants at PG&E successfully completed our Safety Leadership workshop, a major milestone in our effort to align every leader at PG&E with regard to safety. Began a safety workshop series for supervisors and managers with high exposure to operational work. PG&E leaders—managers, superintendents, supervisors, directors and officers—will be given the tools to lead on safety. They will learn practical skills related to injury prevention and protecting the public, employees and contractors. We also continued to enhance our focus on health and wellness. This included an Industrial Athlete Program and ergonomics initiative designed to provide field personnel with tools, techniques, training and support to reduce sprains and strains—the most common types of injuries—as well as causes of cumulative stress on the body. We continue to strengthen our focus on contractor safety to ensure that our commitment to public and workplace safety extends to anyone performing work for PG&E, including contractors. Pacific Gas and Electric Company established a Contractor Safety department with responsibility for developing, implementing and managing a comprehensive contractor safety management program. We are significantly enhancing our pre-qualification process to ensure we hire contractors with strong safety records. And once they are hired, we are enhancing the way we oversee their work. 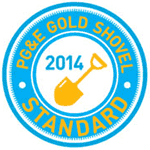 For example, we developed a first-of-its-kind excavation safety program—the Gold Shovel Standard—designed to ensure that contractors doing excavation work for PG&E demonstrate a commitment to safe digging, including calling 811 before any excavation work begins to have underground lines located and marked by utility owners. PG&E assesses progress on employee safety performance using two key indicators: the Lost Workday Case Rate and Serious Preventable Motor Vehicle Incident Rate (both defined below). In 2014, we set a target to reduce PG&E’s Lost Workday Case Rate by 22 percent compared with the 2013 rate. We fell short of this target, as the number of Lost Workdays and our Lost Workday Case Rate rose in 2014. While we have incurred fewer serious employee injuries, we know that we continue to have much work ahead to improve on-the-job safety. 1 Total Lost Workdays is an internal PG&E metric that counts the number of workdays lost in the current year due to occupational injury or illness for all years of injury (current and all prior years). 2 Total Lost Workday Cases is the number of nonfatal occupational injury and illness cases that (1) satisfy OSHA requirements for recordability, (2) occur in the current year and (3) result in at least one day away from work. 3 The Lost Workday Case Rate measures how frequently new Lost Workday Cases occur for every 200,000 hours worked, or for approximately every 100 employees. 4 Total OSHA Recordables is the number of injuries and illnesses that meet OSHA requirements for recordability—those that (1) are work-related, (2) are new cases and (3) meet one or more OSHA general recording criteria. 5 The OSHA Recordable Rate measures how frequently occupational injuries and illnesses occur for every 200,000 hours worked, or for approximately every 100 employees. 1 Refers to the number of serious preventable motor vehicle incidents that that could have been reasonably prevented by the PG&E driver. Measures only those incidents considered to be serious, rather than all incidents that were otherwise preventable. 2 Number of serious preventable motor vehicle incidents that the driver could have reasonably avoided, per 1 million miles driven. We are in the early stages of developing a comprehensive safety management system that integrates and builds upon PG&E’s existing systems and processes. It will offer a structured framework for how we manage safety across PG&E. Key steps to building a stronger safety culture will include implementing a peer-to-peer observation program in high-exposure workgroups, continuing safety leadership development for leaders in targeted workgroups and piloting the expanded use of leading indicators to give us insight into the root causes of serious incidents and allow us to be proactive in prevention. To improve our motor vehicle safety, we plan to strengthen our Motor Vehicle Safety Program by standardizing training requirements and implementing in-vehicle technology such as backing cameras and driver behavior and coaching systems. Additionally, we plan to fully institute a phone-free driving standard in January 2016. Early work to help employees begin the shift to phone-free driving is already underway.